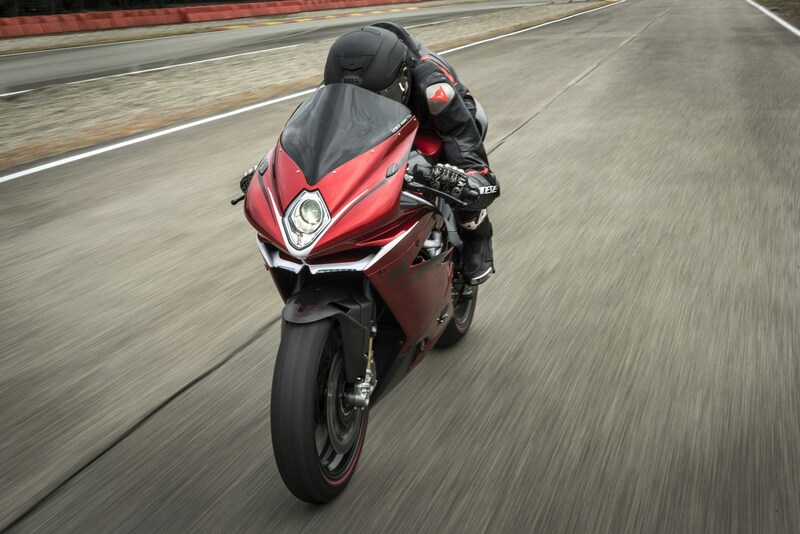 The exclusive MV Agusta F4 LH44 unveiled | IAMABIKER - Everything Motorcycle! Three Time F1 World Champion, Lewis Hamilton, and MV Agusta have collaborated to design a brand new bike, the MV Agusta F4 LH44. This partnership follows the success of their first project on the Dragster RR LH. The MV Agusta F4 LH44 is an offshoot of the F4 RC which is derived directly from the MV Agusta Reparto Corse Superbike, the pinnacle of Italian 4-cylinder performance. Hence, the Corsa Corta engine (bore 79 mm, stroke 50.9 mm) with central timing chain and radial valves, which on this version puts out a maximum power of 205 hp (151 kW). The bike comes with a kit that includes a titanium silencer and dedicated control unit, boosting power by 7 hp to 212 hp (158 kW). It also features Lewis Hamilton’s eye-catching Panther logo. Lewis Hamilton: “I am very excited to continue my partnership with MV Agusta. I love working with Giovanni and the guys at MV Agusta, their passion for engineering and attention to detail produces stunning, original looking bikes. My projects with MV Agusta are a great way to combine my love of riding bikes with my interest in creative design process so I am very much involved with the CRC design team throughout. I am particularly excited to introduce my new bike, the MV Agusta F4 LH44. It looks quite stunning and I had the pleasure of riding on track a few weeks ago in Italy, it feels great and combines the best of both worlds, a race bike for the road! There will be 44 bikes produced so I hope the lucky owners will love it as much as I do”. The customisation that led to the creation of the F4 LH44 was based on a continuous, direct, dialogue between the British Formula 1 champion and the CRC (Castiglioni Research Center) workshop where every MV Agusta takes shape. Ideas, suggestions, preferences, perception: the creative process was long, with attention paid to the bike’s every last detail. Each individual idea was meticulously assessed and checked in terms of its feasibility, flair and functionality. Thorough analysis and creative comparison have made the F4 LH44 much more than just a custom project: it is, rather, an unprecedented, un-repeatable interpretation of the F4. The first distinctive feature is the colour scheme, the result of close teamwork with Lewis Hamilton. The candy apple red fairing and pearl white chassis makes an elegant impact, enhancing the sensational design of the F4 and highlighting this Italian Superbike. Replica’s racing pedigree. This red colouring, one of many unique features on the F4 LH44, is achieved with an exclusive, premium technique that uses ink-based paints as opposed to traditional colour bases. The pearl white that cloaks the TIG-welded hand-built CrMo steel trellis frame was also chosen for the sophisticated detail of the lower front fairing. A touch of dynamism that unites the black graphics along the fairing and continues in the sub-fairing and onto the tail section. With the F4 LH44, the quest for a refined colour scheme extends to the suspension set-up that boasts premium suspension components: an Öhlins USD NIX 30 TiN-coated fork – which offers separately adjustable hydraulic response in compression (left tube) and rebound (right tube), plus pre-load – and an Öhlins TTX 36 rear shock with piggyback reservoir, which, again, can be mechanically adjusted. The colour of the fork and rear shock further heighten the uniqueness of the MV Agusta F4 LH44; the striking black anodised fork outer tubes are the result of a specific agreement with Öhlins. Let’s not forget that this Swedish company has made gold outer tubes one of its hallmarks. The rear spring and shock reservoir are also black, enhancing the sense of exclusivity. Dedicated components include a racing-style fuel cap, forged wheels and unique items such as the rear wheel nut which, on the F4 LH44, has been CNC machined after anodization. 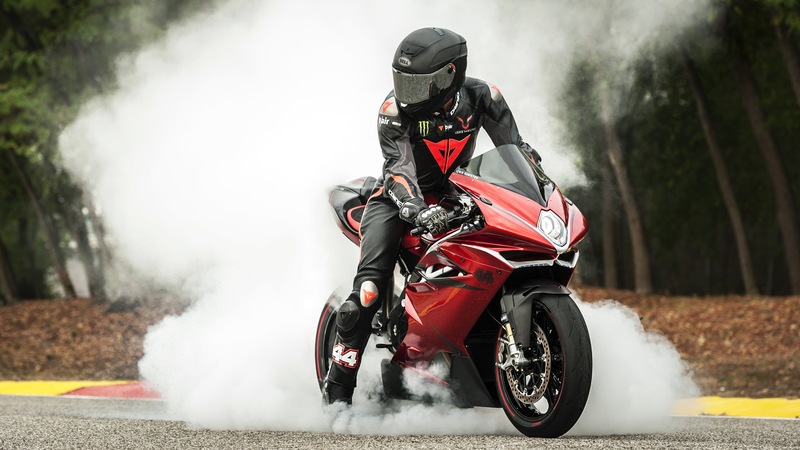 Making the MV Agusta F4 LH44 even more exclusive are the Pirelli DIABLO Supercorsa SP tyres (120/70 ZR 17 at the front and 200/55 ZR 17 at the rear), specifically designed by Pirelli for the 44 edition of the F4 Lewis Hamilton bikes. These special-edition Pirelli DIABLO Supercorsa SP tyres stand out for their red sidewalls, which sport the LH44 logo, comprising Hamilton’s initials and race number. Given the exclusiveness of the bike, the tyres just had to be Pirelli DIABLO Supercorsa SPs, road-approved tyres that offer outstanding racetrack performance.